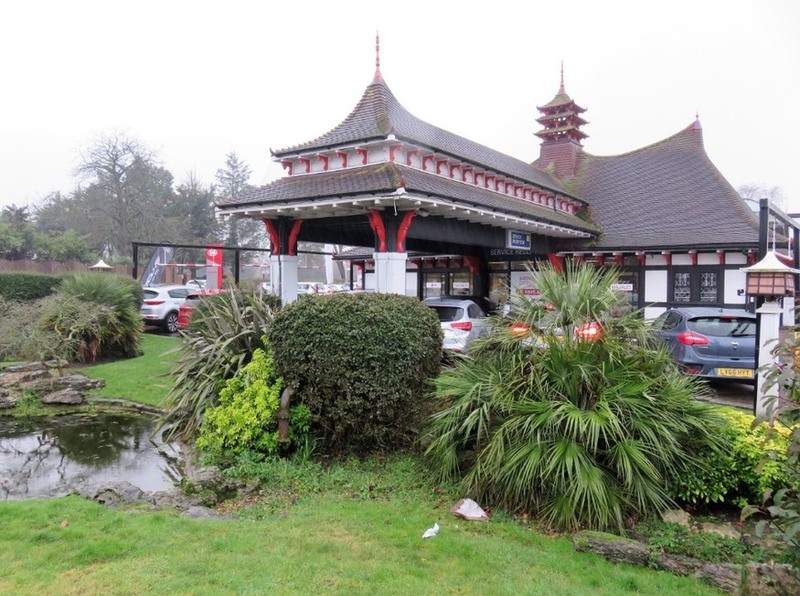 Once a petrol station and now a car showroom, this pagoda-style garage and its lantern-filled garden first popped up on a suburban roundabout in 1929. Why? Well, why not? Local legend has it that the one-time shipping magnate who owned the land was inspired by his travels in the Far East. 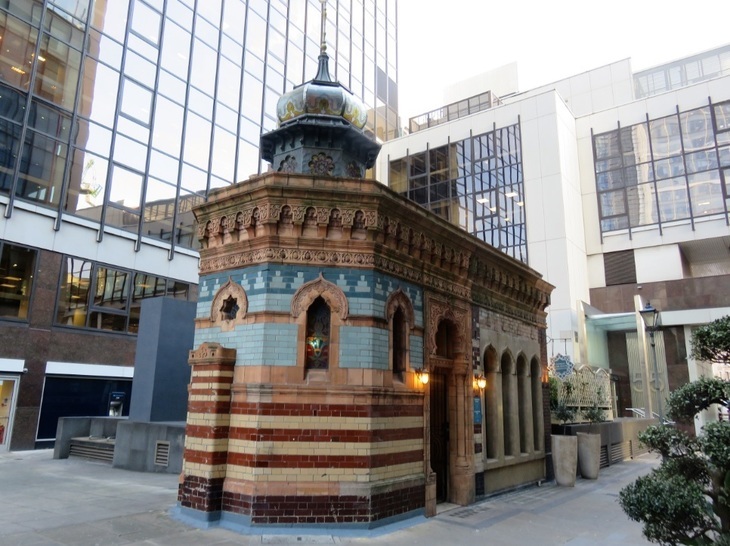 Hold up, we hear you cry: what's that Turkish bath house doing in a City churchyard? Nowadays, it's a fancy party venue – but from 1895 until 1954, this exotic little gem operated as a men-only baths. Having survived the Blitz and numerous redevelopments – not to mention an undignified stint as a storehouse – it's now Grade II-listed and beautifully renovated. 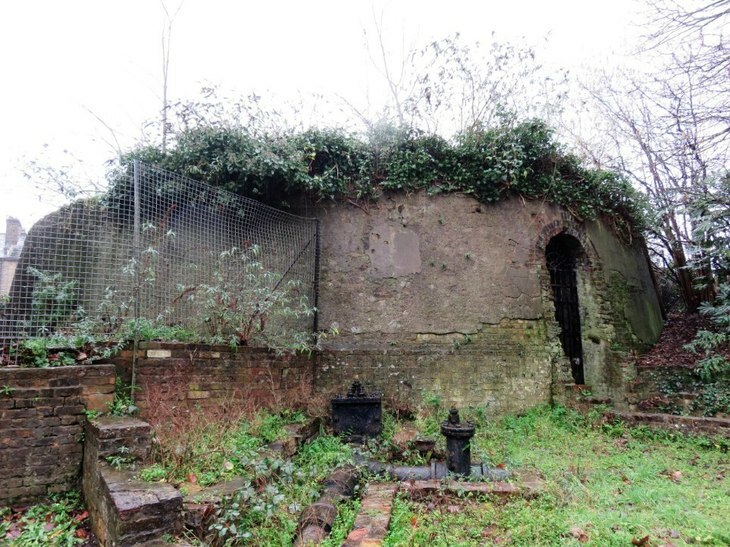 This curious foliage-smothered ruin on Anerley Hill is all that remains of a 284ft-tall water tower – one of a pair designed by Isambard Kingdom Brunel that sat at either end of the old Crystal Palace. Their purpose? To feed the many fountains. Both towers survived the huge fire that destroyed the palace in 1936 – but were pulled down at the start of the second world war due to fears they would serve as landmarks for the Luftwaffe. 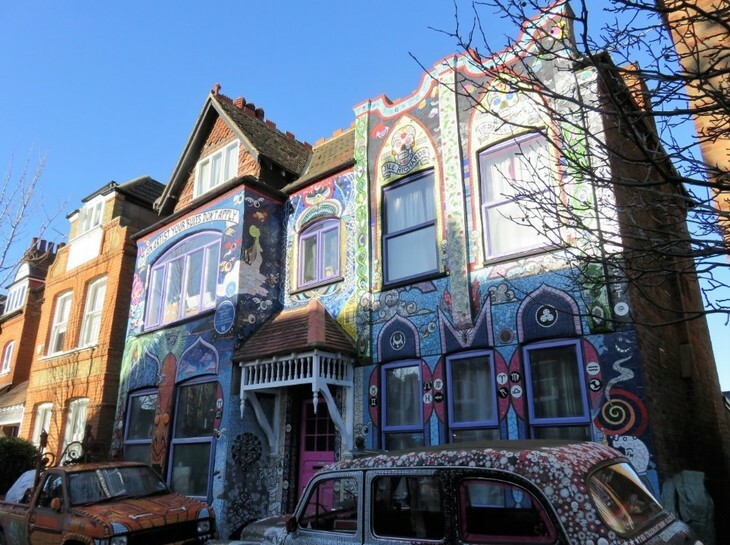 This three-storey house in leafy Chiswick is the home of artist Carrie Reichardt, and the mosaic-covered exterior is a technicolour work-in-progress by Carrie and fellow creatives from around the globe. There's an equally eye-catching tiled pick-up truck and London taxi parked outside — plus an early work by street artist Stik on the garage doors. 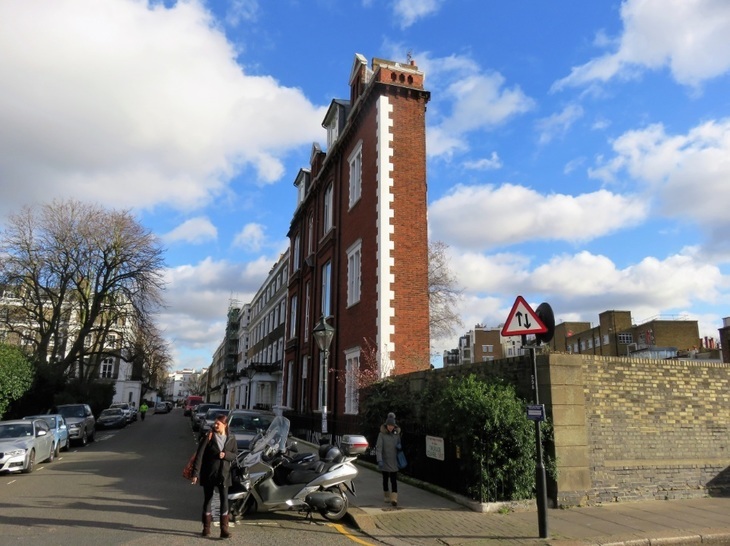 You'll need to be fairly eagle-eyed to spot what's weird about these two upmarket Victorian houses. Give up? It's the greyed-out windows (and no letterboxes). While there's plenty going on behind the net curtains on the rest of the terrace, numbers 23 and 24 are false facades. They were built in 1868 to mask the Metropolitan line extension – and accompanying smoke from the steam trains – that cut through the middle of the terrace. This show-stopping house, with its gabled Chinese-style roof, is thought to be the work of Sir William Chambers, the celebrated architect behind Somerset House and the Kew Gardens pagoda. It was built in around 1775 as a folly for the Duke and Duchess of Buccleuch, who lived nearby in now-long-gone Montague House – and later became home to Caroline of Brunswick, after the break-up of her marriage to the future King George IV. 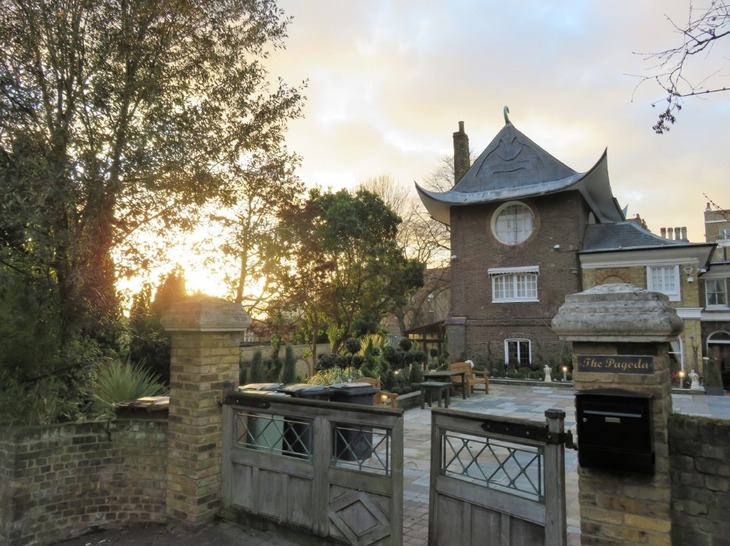 The Pagoda was used as a London County Council children's home during the last century, but is now privately owned again. A small-but-perfectly-formed folly in the middle of Oxleas Wood, this 'castle' was built in 1784 to commemorate Sir William James, a politician and commander of the East India Company. 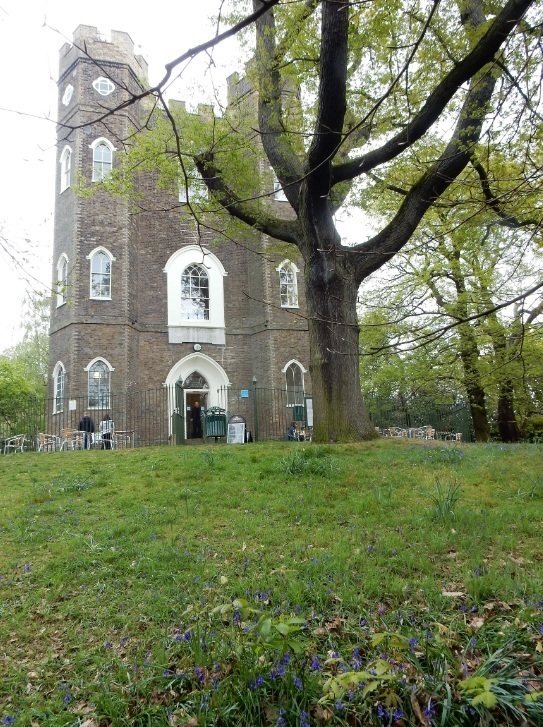 The building has enjoyed mixed fortunes over the years, but is now fully restored and open to the public, offering top-of-the-turret views across London and seven surrounding counties. Breathe in... this end-of-terrace house on Thurloe Square is barely 7ft wide at the thinnest edge of the wedge – although it does widen out to a whopping 34ft. The reason for its odd shape? To accommodate the District and Circle line that runs directly behind the building. 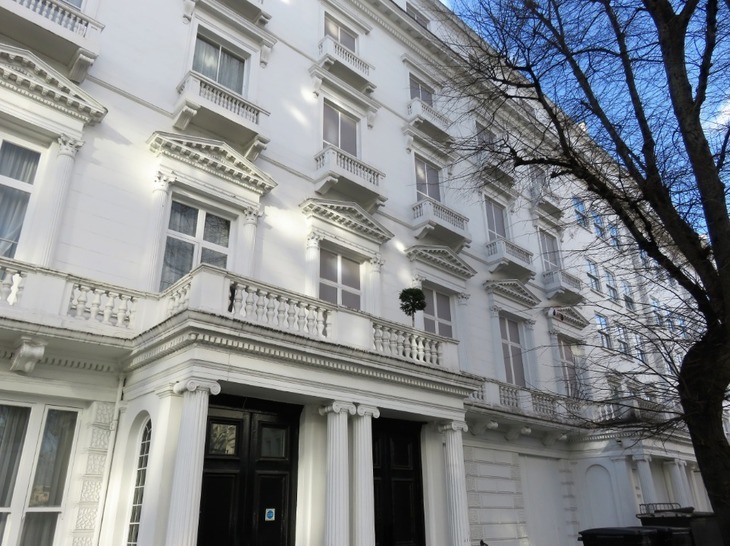 A one-room studio flat inside the house was recently on the market for £895,000. 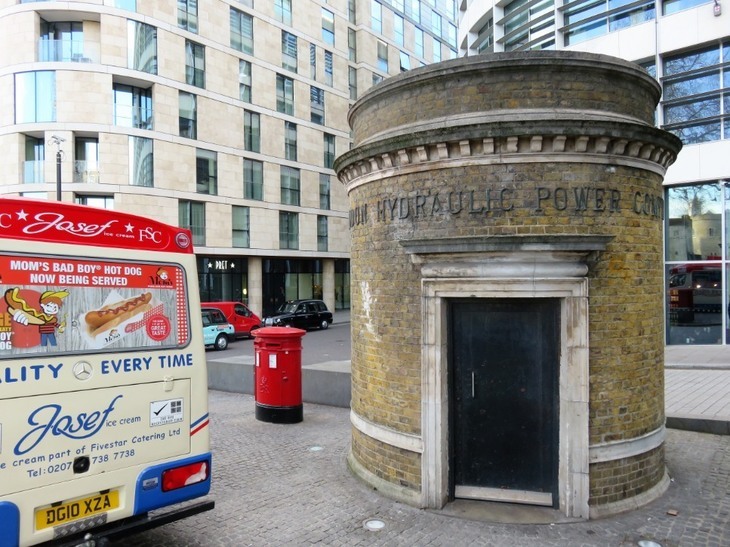 Tucked away next to the Tower of London ticket office, this innocuous-looking round building stands on the site of the original northern entrance to the Tower Subway – a 19th-century pedestrian walkway beneath the Thames. The 7ft-wide tunnel unsurprisingly plunged in popularity when Tower Bridge opened in 1894, and is now used to carry telecommunications cables. 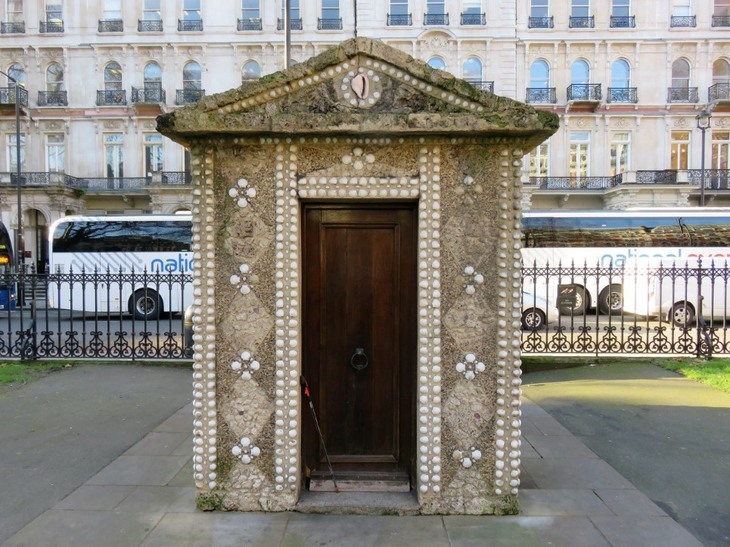 Lower Grosvenor Gardens has been home to two much-admired shell-covered huts since 1952. That's when the gardens were given a Gallic makeover by Jean Moreux, architect-in-chief of the National Monuments and Palaces of France. Designed in the style of 18th-century fabriques – the French term for 'follies' – the huts showcase shells from the beaches of England and France. Now as then, they're used to store gardening equipment. Many a car or coach passenger on the A4 has been momentarily distracted by the unexpected sight of a glorious blue and gold dome peeping out between the more common-or-garden West London rooftops. 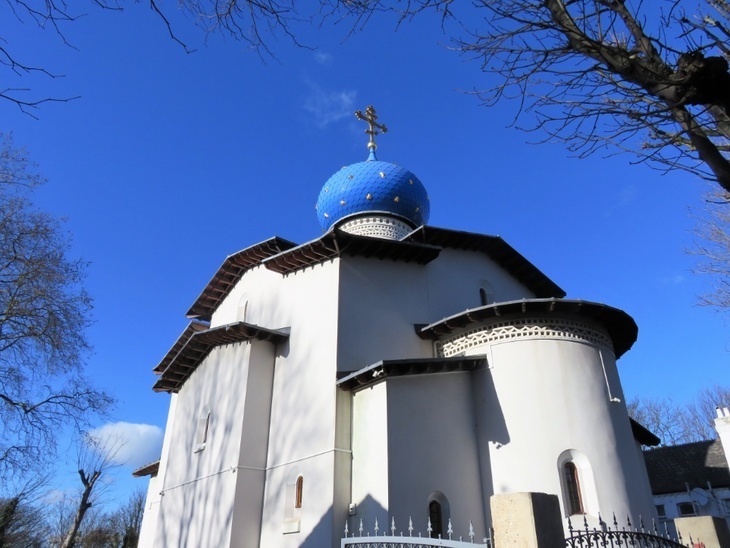 This – to use its not-so-snappy full name – is the London Russian Orthodox Church Abroad's Cathedral of the Dormition of the Mother of God and the Royal Martyrs. It's been open for worship since 1999, and guided tours are available on request. This Grade II-listed water tower and pumping station in Exchange Square were completed in 1866. 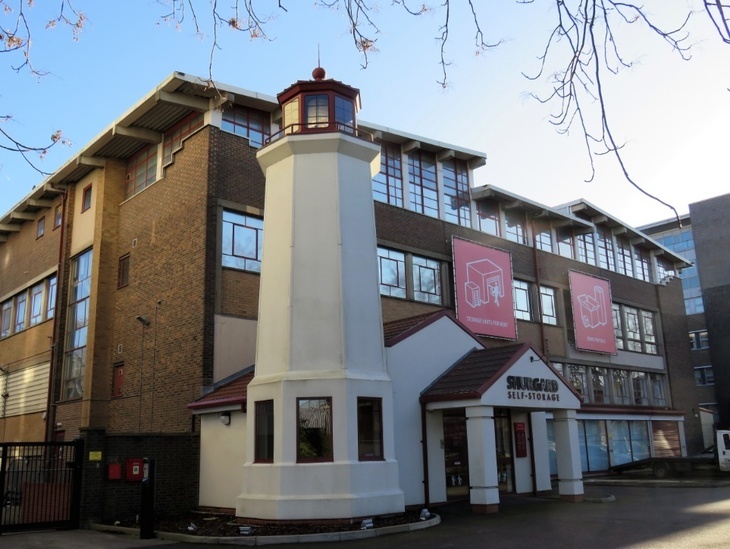 The building has been empty for a good long while, but Historic England and Croydon Council are reportedly considering various ideas for its future use. 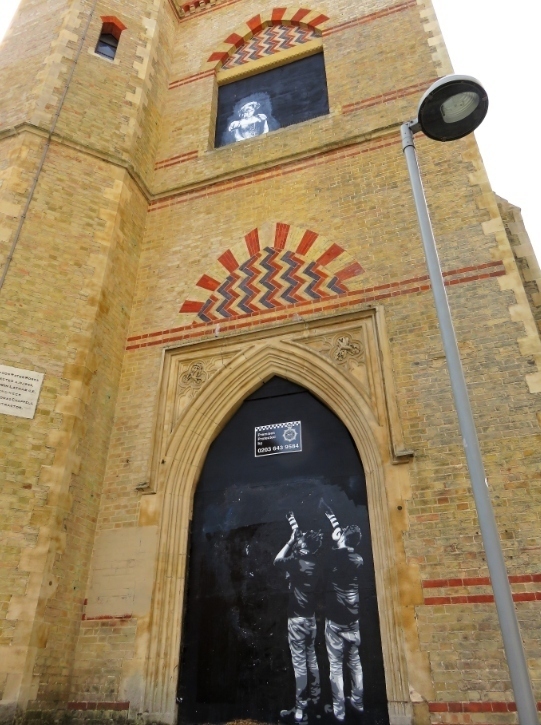 In the meantime, local street artist Rich Simmons has decorated the tower with a much-admired mural of the paparazzi taking snaps of Princess Diana.